Carpeting comes in varied types and colors. A well cared for carpet, be it wall-to-wall or an area rug, will last a long time. Some carpets, however, are subject to grievous wear and tear. Replacement isn’t always necessary if you have a professional carpet repair service assess the damages. Our carpeting repair company works with folks in Reno and Sparks, Nevada to help restore tired looking rugs back to almost new condition. Many people experience stretched out wall-to-wall carpeting throughout the lifetime of the carpet and this can become an issue of potential danger of tripping and falling, if not corrected. 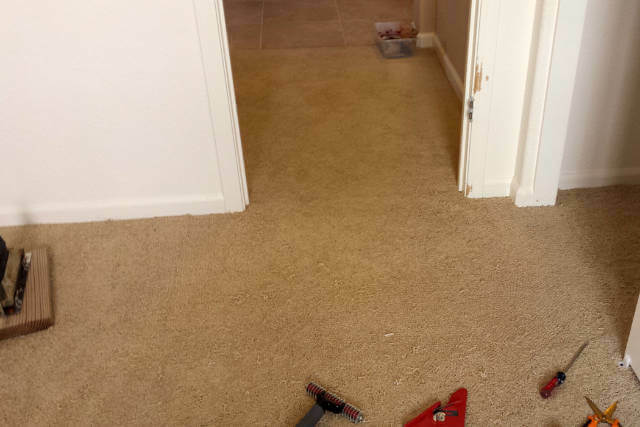 Our pro rug repair personnel for the towns of Reno and Sparks, Nevada, use a carpet power stretcher to pull the carpeting back into it’s original state. A power stretcher is a tool with a head composed of nails that allows our carpet repair workers to smooth out wrinkles. Domestic animals make beloved pets for Reno and Sparks citizens but, unfortunately, a bored dog left to it’s own company will, occasionally, dig or rut at a carpet creating frayed edges or even holes in a rug.. Cats don’t always get the “don’t scratch the carpet” message so that can often be another rip and tear issue, one which our Reno and Sparks carpet repairers have the expertise to fix. 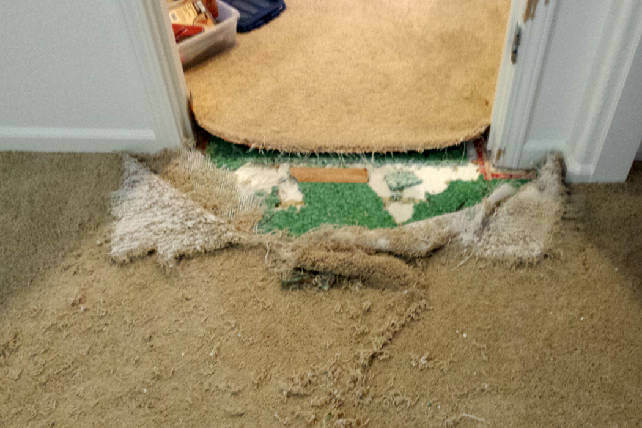 Another typical pet problem that affects home carpeting is pet urine. A nasty, foul odor permeates carpets of all types. Urine leakage doesn’t stop in the carpet itself, it seeps through right into the padding under your rugs. Our trained carpet repair pros are capable of making that unpleasant situation disappear. Our carpet repair specialists remove both the soiled piece of carpet as well as a piece of the padding and then treat the area with a strong enzyme, followed by the installation of new padding. Then the treated part of the rug is put back and the carpet goes through a cleaning process, creating a refreshing and renewed look and feeling to your home, whether it happens to be in Reno or Sparks. 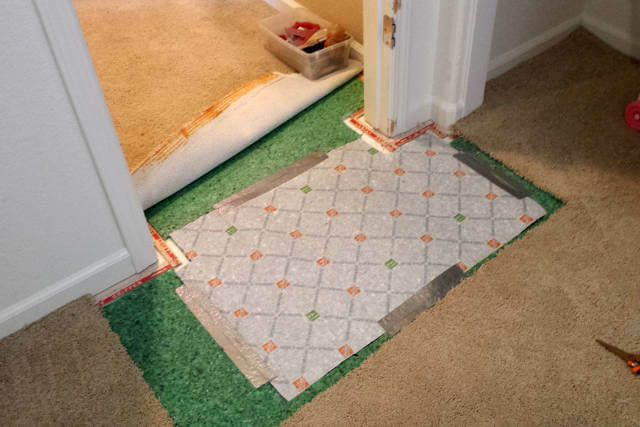 Each type of problem resulting in damage to carpeting might involve a different solution. Our carpet repair experts are trained and educated to apply the proper carpet repair method. Homeowners can be assured that their Reno or Sparks rooms of carpeting will be handled with sound judgment and TLC. To all Nevada residents in the cities of Reno and Sparks….if you have been under the impression that your rugs and carpets can’t be repaired, our carpet repair business is ready, willing and able to prove the opposite. Our company’s team of carpet repair is highly skilled in the art of carpet repair and, in fact, our services will most likely surprise our friends in Reno and Sparks with the extraordinary results derived from our repair specialists in the field of carpeting.